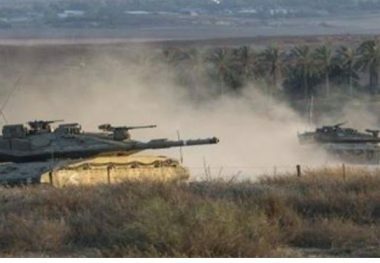 Israeli soldiers carried out, on Monday morning, a limited invasion into Palestinian lands, near the border fence, in Khan Younis, in the southern part of the Gaza Strip. Eyewitnesses said several armored vehicles, including bulldozers, carried out the limited invasion into the Palestinian lands. They added that the vehicles invaded the lands through Sofa gate, near the military base, across the border fence, and fired several live rounds, in addition to smoke bombs. In related news, Israeli navy ships fired many live rounds at Palestinian fishing boats, in Gaza territorial waters, in the northern part of the coastal region. The fishermen had to sail back to the shore in fear of further escalation. In addition, the soldiers detained a young man for several hours in Sa’ir town, northeast of Hebron, and invades nearby towns, in addition to installing many roadblocks, before stopping and searching dozens of cars. On Monday at dawn, the soldiers abducted a Palestinian lawyer, and a child, after invading their homes and violently searching them, in occupied East Jerusalem. In addition, the soldiers abducted nine Palestinians from their homes, in several areas of the West Bank governorate of Bethlehem.